"Scrambled eggs can be made quickly and along with it if vegetables are added its a great start of the day and healthy too as eggs are of great in vitamins and proteins whereas vegetables are rich in fiber and vitamins as well. if you prefer low in fat you can use more egg whites than the yolks." In a large thick kadai or wok heat oil over medium high. Now add chopped onion,tomato,carrot,beans and cabbage and mix well by adding half pinch of salt and saute well until its tendered. Now add turmeric and garam masala and mix well until the raw smell of masala disappear and put of the flame and keep it aside. Now break the eggs into another bowl and whisk well until frothy. Take another pan heal oil and pour the eggs in it and add black pepper and stir well with the help of a fork so that the egg scrambles into very tiny pieces. Now add the vegetables which we had already cooked and mix well into the scrambled egg. 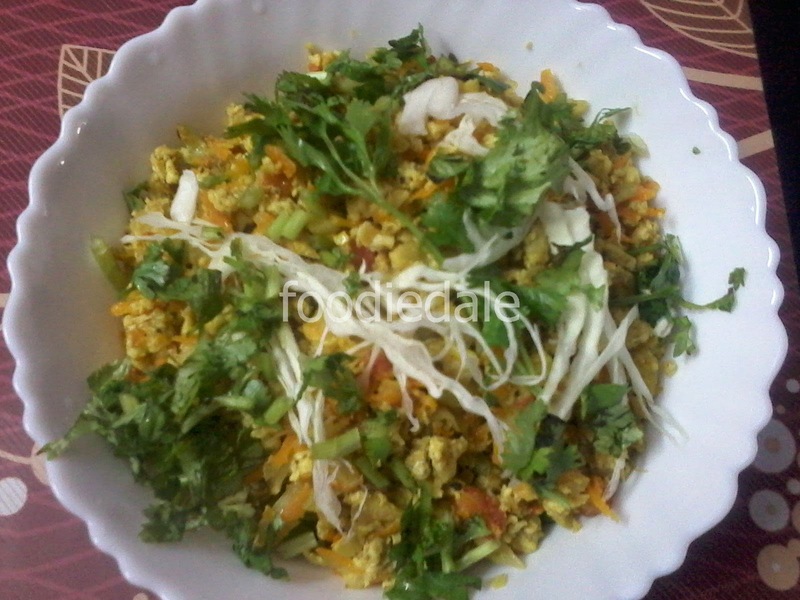 Turn off the flame and serve it into a bowl and garnish it with coriander leaves. You can enjoy it with chapati or bread and tomato sauce.